This is a regular series about friends who have met celebrities. I like baseball. I have a fascination with baseball families. I don't particularly like the Los Angeles Dodgers, but I like Evan Chavez and I like his site, IBleedDodgerBlue2.com. Evan lives in New Mexico, which happens to be the home of the Dodgers Triple A team, the Albuquerque Isotopes. Evan is a Dodgers fan, an Isotopes fan and a baseball fan. That all comes together for a fun site. I Bleed Dodger Blue 2 has a lot Dodgers-related stuff, but it is more than just a Dodgers site. Evan also writes about player appearances, baseball events, baseball cards and plenty of other fun stuff. In December, Evan wrote about Scott Van Slyke in a post called Van Slyke Designated for Assignment. This caught my eye, because II always have special interest in baseball families. Scott is the son of former player Andy Van Slyke. The Dodgers had put Van Slyke on the DFA list. Since then, Van Slyke cleared waivers and will start the season as an Isotope. Van Slyke hit a disappointing .167 in limited time for the Dodgers last year, but is only 25 and has produced excellent numbers in the minors. I think this is just a bump in the road for Van Slyke. Whether with the Dodgers or elsewhere, I think he will have a solid major league career. His father started out a bit slowly and went on to have an excellent 13 year career. Maybe Van Slyke will be back with the Dodgers in 2013. If he is, I am sure Evan will write about it. Be sure to get a head staron the baseball season by checking out IBleedDodgerBlue2.com. 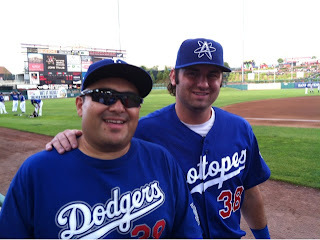 Evan Chavez and Scott Van Slyke in Albuquerque, NM-Summer 2012.